Here are some useful websites that I use often. Plus you can get your fishing license on line. WWW.midhudsontu.org. 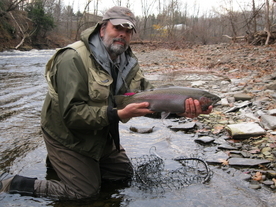 My Local Trout unlimited chapter for Dutchess County. www.dec.ny.gov. New York State Department of Environmental Conservation. Here you can obtain a on-line state license. "outdoor Activities"
www.intellicast.com. Weather channel website, before taking off for the day or long weekend, even a fish-camp know the weather! www.tu.org. The National website for Trout Unlimited. WWW.riffleandrise.com. John Bocchino offers some of the best guide trips in Colorado's Gunnison area! You want big fish, no crowds, great scenery then this is the area for you. He guides the Black canyon, the Gunnison, Taylor and the East River. www.farmingtonriver.com. A local flyshop near the farmington river with updated river flows. www.Orvis.com/knots. Step by step animated guide to tying knots. www.catskillflies.com. A local fly-shop in Roscoe New York, that meets the needs of the Angler on the Beaverkill and Willowemoc.